In 1986, the year before his death, Andy Warhol continued his appropriation of classic American icons and images with his “Cowboys and Indians” series, a portfolio of screenprints representing traditional figures and figureheads of the American West. 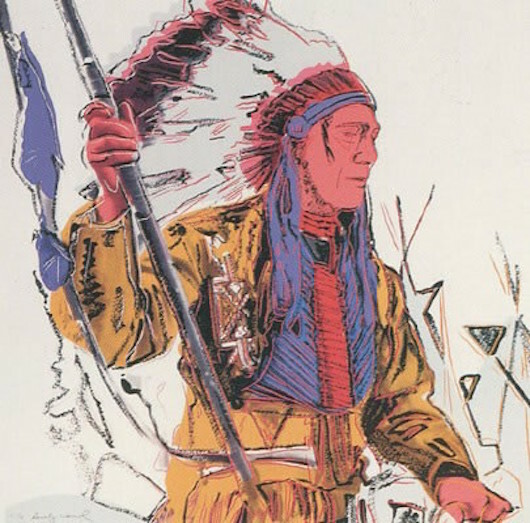 Bonnet Indian is a continuation of Warhol’s Cowboys and Indians portfolio in which he interspersed recognizable portraits of well-known American “heroes”–John Wayne, Annie Oakley, Teddy Roosevelt, and General George Custer–with less familiar Native American images and motifs in his ironic commentary on Americans’ collective mythologizing of the historic West. Rather than portraying Native Americans within their historical landscape or Cowboys in their veritable forms, Warhol chose to portray a popular, romanticized version of the American West. The West that he chose to represent is familiar to everyone and can be seen in novels, films, TV series. Warhol’s Cowboys and Indians Suite is an ahistorical representation that mirrors a popular interpretation of the American West.War Bonnet Indian is a fine example of Warhol’s aesthetic intent in its reduction of an entire heritage and way of life into a single “trademark” image.